KEM Plastic Playing Cards is one of the companies which are in the gambling market. They are specialized in manufacturing of 100% cellulose acetate plastic. KEM plastic playing cards contain no vinyl, which is the raw material used by all other playing card manufacturers for their "plastic" playing cards. 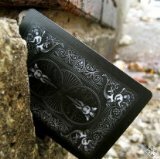 KEM cards can handle the wear and tear like no other brand of card in the industry. KEM's high performance cards will last longer, shuffle better, and deal in such a manner that you will never want to play with anything else again.